A: Why did you buy so many file folders. 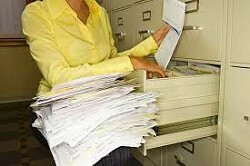 B: I have to file a lot of documents and organize my desk. A: Why aren't you taking your lunch break ? B: I have to organize the documents before my client comes this afternoon.